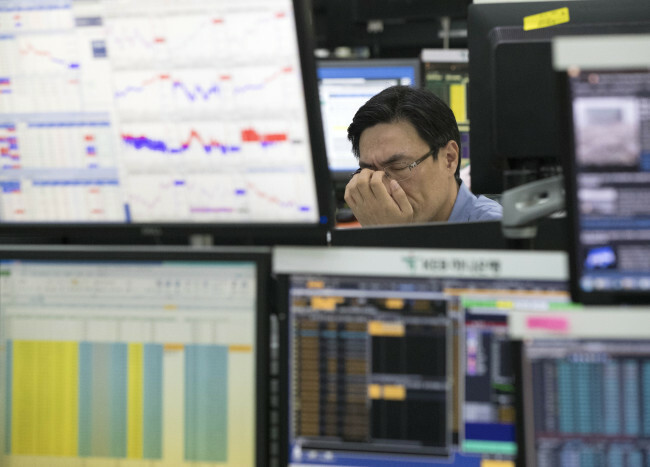 Companies listed on South Korea’s top-tier stock market Kospi saw their debt-to-capital ratio come to 111.4 percent in 2017, up 0.9 percentage point on-year, data showed Monday. The combined amount of liabilities of Kospi-listed firms reached 1,182.8 trillion won ($1.1 trillion), up 2.5 percent compared to a year prior, whereas the volume of capital came to 1,061.9 trillion won, up 1.7 percent, according to data compiled by the Korea Exchange. The market operator analyzed data on 598 firms out of 745 trading on the Kospi as of end-2017, excluding 101 financial firms and 46 firms whose corresponding data for the previous year were not available. Of all, firms with liabilities more than double the capital took up 14.9 percent, up 0.4 percentage point on-year, while firms whose capital was larger than debt accounted for 54.3 percent, down 1.6 percentage points. The tendency of indebtedness was the most visible among refiners of oil and briquettes, as well as real estate-related business entities, according to the KRX.